For the first time, Las Vegas participated in yesterday’s Earth Hour. 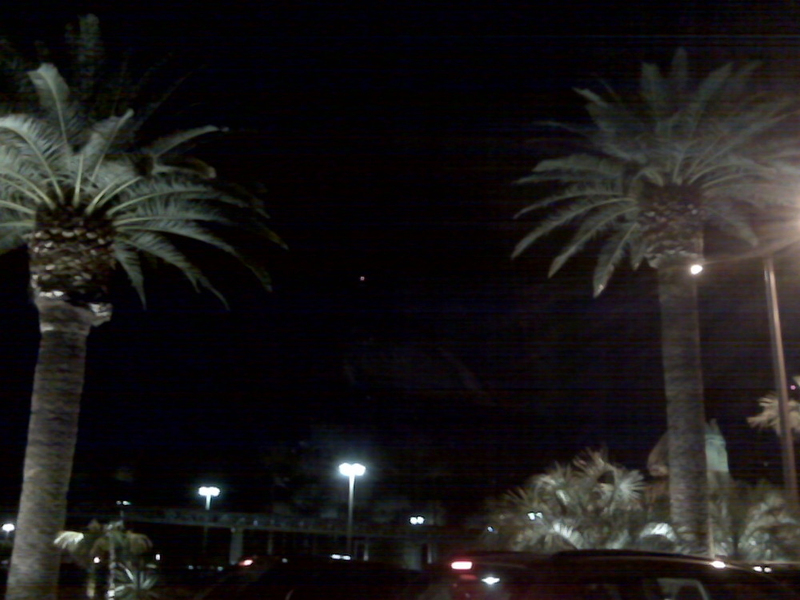 On March 28, 2009 from 8:30pm – 9:30pm PST, the majority of the Strip went dark. It was eerie and cool at the same time. At Luxor, we turned off the Beam and all the lights on the pyramid. We almost looked invisible! 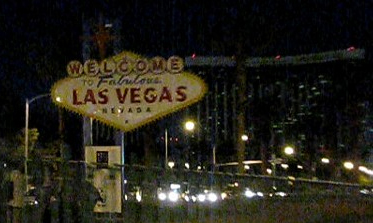 Other iconic participants included the Welcome to Las Vegas Sign, Freemont Street Experience and the Bellagio Fountains. 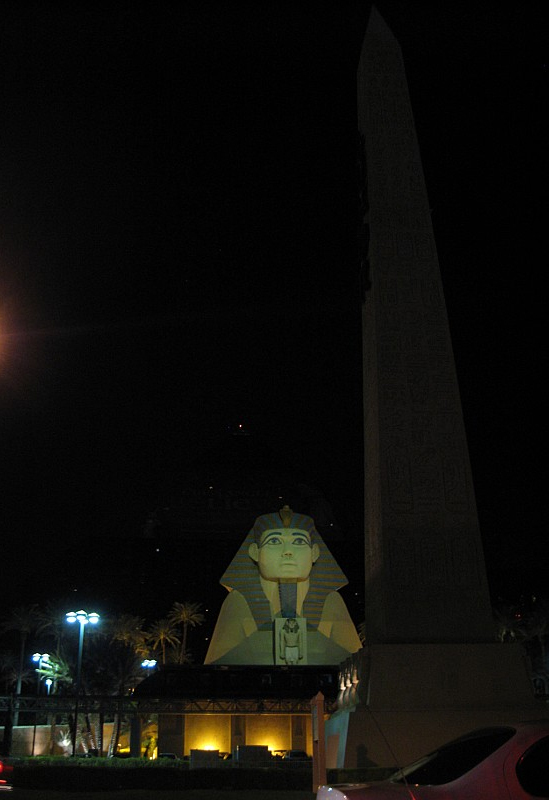 Thanks to Vegas Rex, below are some really great pictures of Luxor during Earth Hour. You can see more of his Earth Hour pictures of the Las Vegas Strip here and some videos from the Las Vegas Sun here. With such a unique shape, the building also allows for some cool and creative outdoor ad placements. You can see some of them here. For most of the building wraps, we partner with Sky Tag for the production and placement. This time was no different. 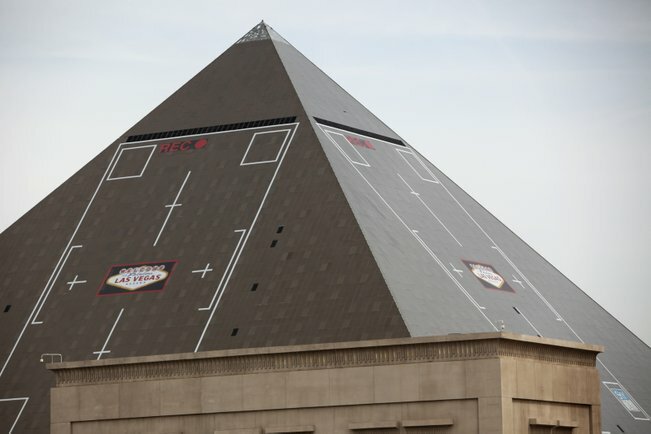 As we continue to move away from our Egyptian theme, this building wrap helps to remind people about the excitement, intrigue and mystique of both Luxor and Vegas. “Now more than ever, we’re trying to get people to think about taking a break and to get away from the stress they may be encountering. We want to get them thinking about Las Vegas as a primary and economical vacation and business destination,” Goldberg said. For more information, quotes and pictures, read this article by the Las Vegas Sun. For more information on partnering with Luxor, visit our Strategic Partnerships page. New Year’s Eve in Las Vegas was nothing short of spectacular! From people winning jackpots to Robbie Maddison and Evil Knieval’s son jumping over the Mirage volcano to a multitude of celebrities hosting parties at the night clubs, it was surely a night to remember and the perfect way to ring in 2009! 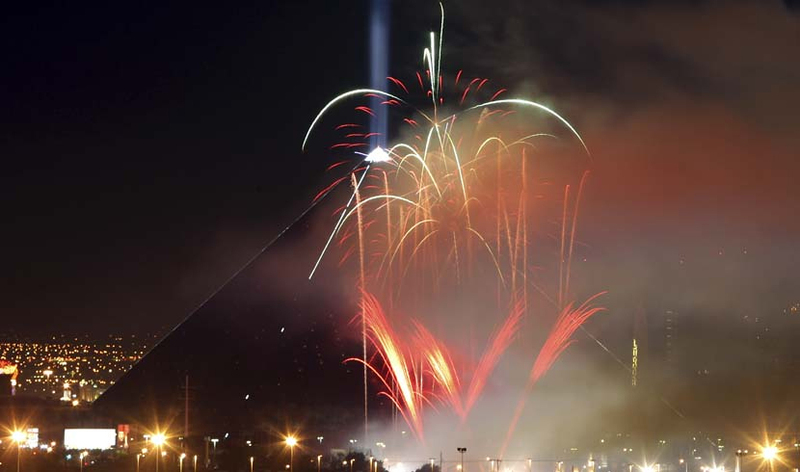 Of course, it wouldn’t be a party without fireworks and the ones viewed from Luxor were gorgeous! From all of us at Luxor, Happy New Year! Thank you for making this year so phenomenal! I for one, am looking forward to an even bigger, better and brighter 2009. Thanks to a suggestion by Jeremiah Owyang, I asked our Twitter followers if anyone would be interested in writing a guest post for this blog. A few fabulous twitterers responded. This one, by David Raatz (@raatz) is the first in the series. Yes, Vegas-style hedonism is even available for Vegans! Las Vegas offers an amazing array of decadent pleasures for everyone – including vegetarians (people who don’t eat meat) and vegans (people who don’t eat any animal products, including dairy). I’ve been a vegetarian for ten years and a vegan for five years, and I always look forward to my culinary adventures in Las Vegas. The below, brief manual is a tool for my fellow vegetarians or vegans and for others who are interested in enhancing their Vegas food experiences. The rundown isn’t intended to be comprehensive. I freely admit that it reflects my biases and favors casual, inexpensive dining. But I hope you find it helpful and interesting. I’ll start with the South Strip because that’s where I always spend a large percentage of my time. Video poker and blackjack are my favorite activities, and Luxor and its next-door neighbor, Mandalay Bay are my favorite casinos for those always entertaining games. Mexican restaurants often provide excellent vegan meals, and Border Grill at Mandalay Bay is a perfect example. Border Grill ranks among my favorite restaurants in the world. I love the shaded, patio-style seating near the Lazy River. The fresh air is always refreshing. The patio is an especially fun location in the summer. It seems to be one of the coolest places in town – both in temperature and in hipness. As a bonus, from May through September, you can listen to the Mandalay Bay Beach Concerts! The Portabello Mushroom Mulitas is one of the most consistently satisfying vegan entrees I’ve had anywhere. The Mexican chopped salad (without chicken) is nearly as good, featuring grilled corn, roasted peppers, avocado, tomato, apple, pinto beans, red onion, tortilla chips and romaine lettuce tossed in coriander vinaigrette. Border Grill’s chips, salsa (red and green) and guacamole are also marvelous. The only negative is that it’s a long walk from the main casino area. But, you’ll have a guaranteed payoff for your investment of time and energy. A 24/7 source for comfort food in a beautiful setting right off the Mandalay Bay casino floor is Raffles Café. It sounds a bit silly, but enjoying the simple goodness of oatmeal at Raffles is an outstanding way to start or end a day, especially with fresh fruit on the side. I’ve partaken many times. The bottomless strong coffee can help you regain some clear thinking if it was lost in the casino madness. Luxor has a new Mexican-themed place with a lot of appeal (although I haven’t been able to try it yet) – T&T. Chef Richard Sandoval has created several interesting options. The creative-sounding Mediterraneo burrito includes falafel, tahini, tomato, green bell pepper, mint and tamarind pico de gallo. Mouth watering! See you soon at one of my old favorites like Border Grill – or perhaps a new hangout like T&T! Check back later for the Vegan’s Dining Guide to the Center Strip! 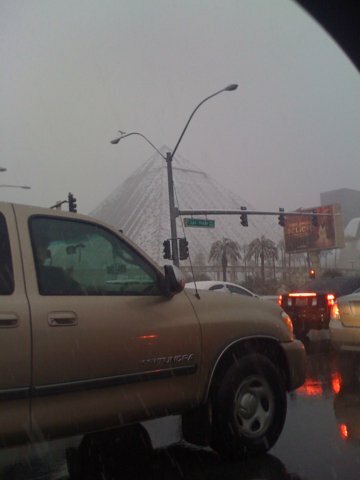 I wrote and posted pictures of the Luxor Pyramid covered in snow yesterday here. But, our HR team got an even better picture! So much so, that I thought this new picture deserved it’s own post. 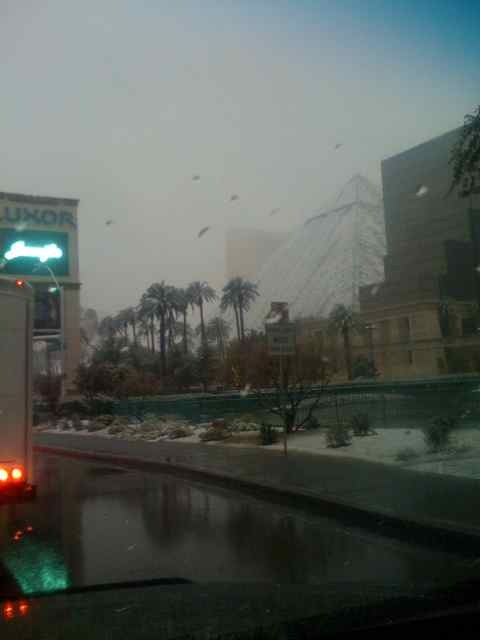 As crazy as it sounds, it snowed on the Las Vegas Strip today! In fact, it’s snowing so much that the LAS Airport shut down, roads closed and students have a Snow Day tomorrow! 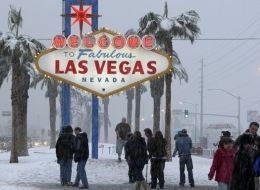 According to the TV news, Las Vegas hasn’t seen this much snow in 30 years! The coolest part of the day? 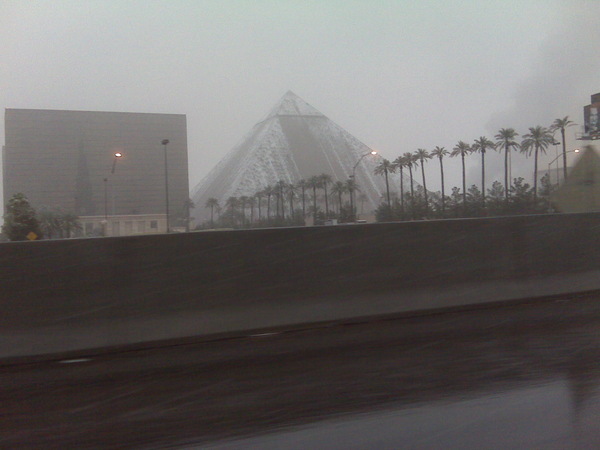 The Pyramid started to become covered in snow. Because of it’s shape, it was one of the few buildings that held the snow in a way that you could really see it. 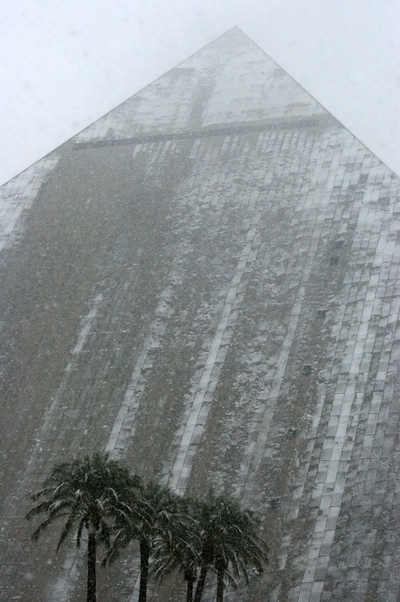 If it snows more tonight, maybe we’ll get to go sledding down The Pyramid (just kidding, but wouldn’t that be fun?!). Anyway, thanks to Twitter, I was able to compile a few pictures of what it looked like. They were all taken while driving, so the quality is a little poor, but they are all very cool! Enjoy. My Yahoo! Answers to questions about Las Vegas.